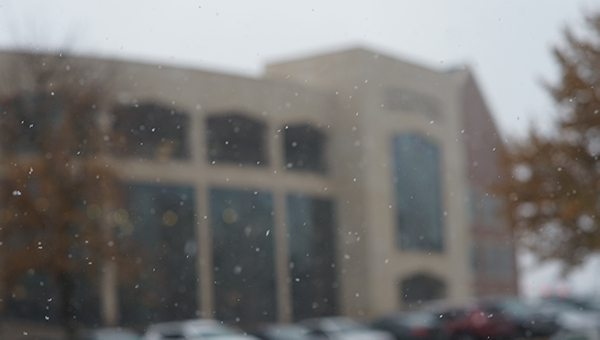 Snow falls in front of the Library and Academic Resources Center on Nov. 12, 2018. The residential life office will be closed on Saturday, Jan 12, and check in hours have been extended for residents due to the ongoing winter storm, according to an email sent out around 8 p.m. The email encourages residents to head directly to their residential area. Check in hours have been extended to run from 9 a.m. until 5 p.m. Saturday and Sunday, and residents arriving outside of that window can call the front desk of their building. Buildings should have their phone number posted on the window, or they can be found here. Local news stations are reporting highway closures and flight cancellations into and out of Lambert St. Louis International Airport. The winter storm is not expected to let up until early Sunday morning.